A Tough, Off Road Ready ATV Accessory! The Longhorn is a low cost solution for landfills and disaster response teams looking to pick up metal debris. A Tough, Off Road Ready ATV Accessory. 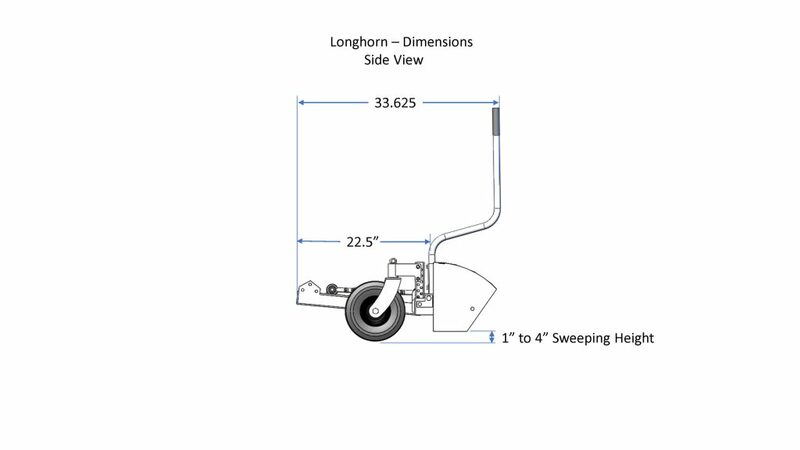 The Longhorn is a tough, front mounted ATV magnetic sweeper designed to fit almost every brand and size of ATV right out of the box. 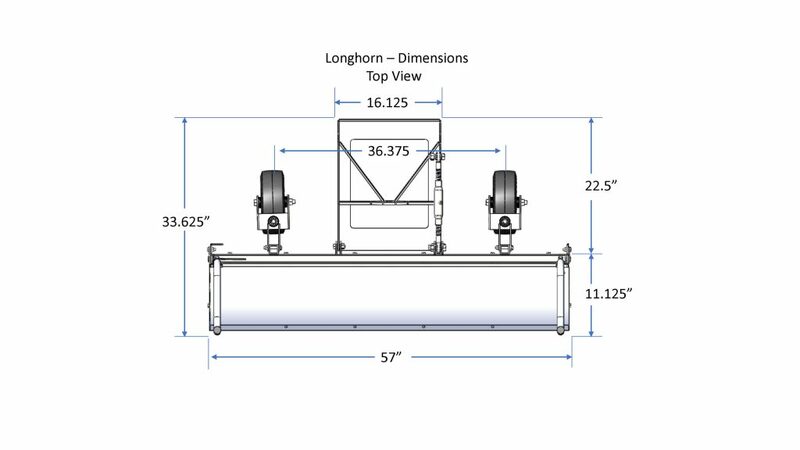 Because the Longhorn mounts to an ATV it is ideal for picking up metal debris at disaster response and clean up sites, farms, construction sites, industrial site roads and yards, site remediation and landfills. ATVs are a low cost off road vehicle that are often already at these sites and can complete the task of picking up metal debris faster and at a lower cost than larger vehicles. The Longhorn is the perfect match for an ATV because it is tough, compact and built for off road conditions and unfavourable environments. It has a solid steel frame construction, flat proof tires and the magnet itself is protected and fully enclosed in stainless steel. 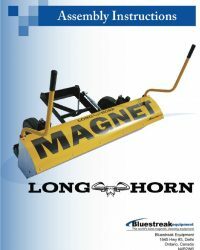 The “Wrap Around” magnet design adds to the Longhorn’s off road capabilities ensuring debris never gets wiped off the bottom of the magnet in grass or dirt conditions. The “Wrap Around” feature is an essential design feature if you will be using the magnetic sweeper in grass or dirt conditions. 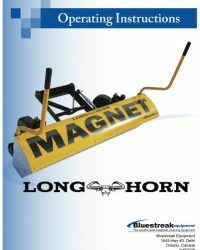 The magnet sweeping height is also adjustable from 1 to 4 inches, in half inch increments, to accommodate any ground conditions. A quick overview of the Longhorn’s main features. The ATV Accessory that takes debris by the horns. Many commercial and industrial facilities, farms, construction sites, landfills and disaster relief workers have a need to eliminate flat tires on ATVs and other vehicles. 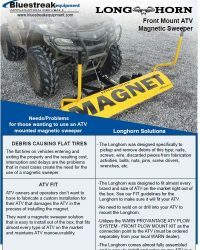 The cost, interruptions, and delays that flat tires cause create the need for the use of a magnetic sweeper. The Longhorn was designed specifically to pick up and remove debris that causes flat tires such as nails, screws, wire, discarded pieces of metal from fabrication activities, bolts, nuts, pins, screw drivers, wrenches, etc. The Longhorn was designed to fit almost every brand and size of ATV right out of the box. See our FIT guidelines to make sure it will fit your ATV. 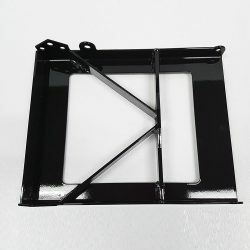 No modifications to your ATV are necessary to mount the Longhorn except the installation of the WARN PROVANTAGE ATV PLOW SYSTEM – Front Plow Mount Kit. There is no need to modify, weld on or drill into your ATV in order to mount the Longhorn. The Longhorn is compact in size. For further information see the CAD section for CAD drawings showing overall dimensions of the Longhorn. The Longhorn comes standard with a Debris Release Lever clean off system. Just raise the magnet using your ATV winch, and push down on the clean off handle on either side of the unit. 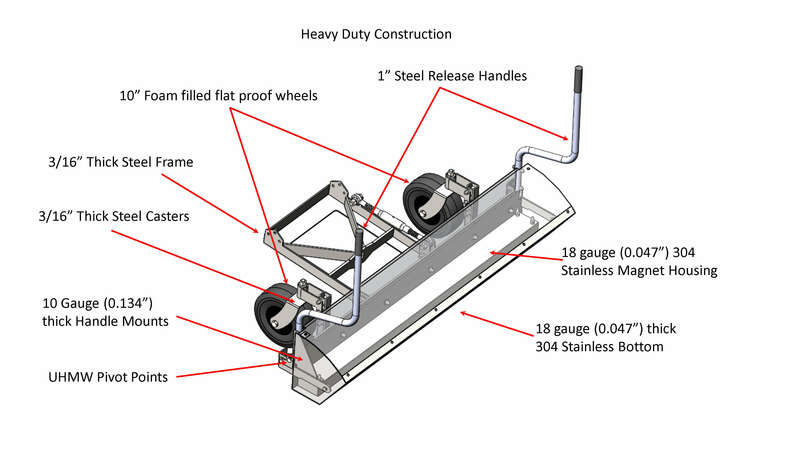 A quick pull on the handle rotates the magnet inside the covered lid resulting in the debris dropping to the ground. Clean off takes only seconds. 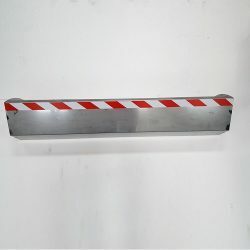 To make clean off even easier, a double handled orange poly debris catcher is provided to put under the magnet during clean off, which can then catch the debris and be used to dump the debris into a garbage bin. 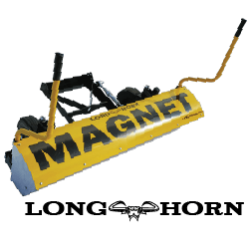 The “Wrap Around” magnet design ensures debris never gets wiped off the bottom of the magnet in grass or dirt conditions. The “Wrap Around” feature is an essential design feature if you will be using the magnetic sweeper in grass or dirt conditions and is one of the key features that make the Longhorn truly off-road capable. Easy to use debris clean off system. Debris Release Handles do the job in seconds! The Longhorn comes standard with a Debris Release Lever clean off system. A quick pull on the handle rotates the magnet inside the covered lid resulting in the debris dropping to the ground. Clean off takes only seconds. To make clean off even easier, a double handled orange poly debris catcher is provided to put under the magnet during clean off, which can then catch the debris and be used to dump the debris into a garbage bin. The Longhorn is compact in size and is balanced to perfectly fit an ATV to allow normal ATV manoeuvering. For further information see the CAD section for CAD drawings showing overall dimensions of the Longhorn. The Longhorn will pick up a 2 ½” nail when the bottom of the magnet is 7 1/4 inches” off the ground providing plenty of pickup power performance in dirt and gravel and when operating on a moving ATV. In speed tests the Longhorn reliably picks up 2 ½” nails at 13kph, with the sweeping height set at 2 ½” off the ground. The Longhorn uses a permanently charged grade C8 magnet that is 2″ x 4″ x 54″ that will never need to be recharged. Power will never decrease, ensuring years of use. 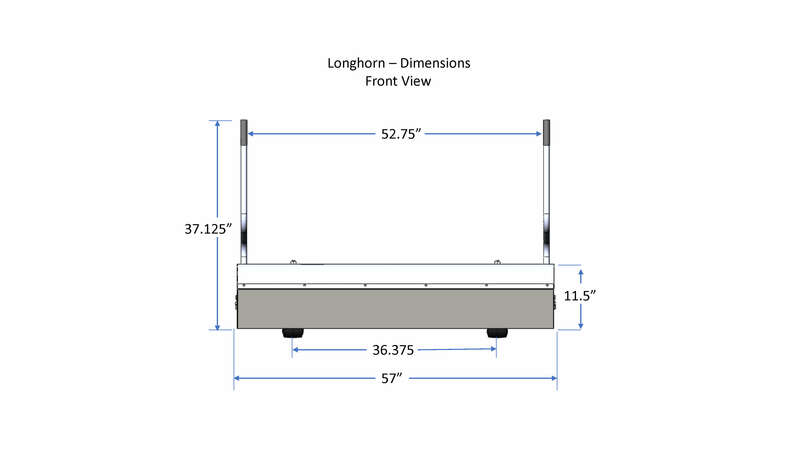 The Longhorn magnet is completely enclosed in stainless steel for protection from the elements and to ensure the magnet never becomes covered with debris. Heavy duty construction for long term durability. Sand blasted and powder coated steel components for durability that will continue to look good for years to come. The Longhorn once setup can also be hitched and de-hitched quickly when needed. No modifications to your ATV needed! WARN PROVANTAGE ATV PLOW SYSTEM – Front Plow Mount Kit. 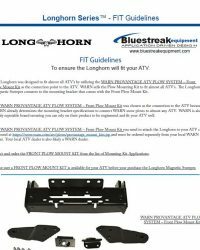 No modifications to your ATV are necessary to mount the Longhorn except the installation of the WARN PROVANTAGE ATV PLOW SYSTEM – Front Plow Mount Kit. There is no need to modify, weld on or drill into your ATV in order to mount the Longhorn. 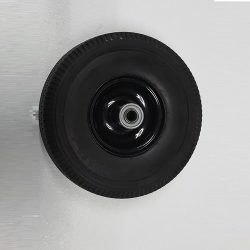 The off-road flat-proof 10” x 3” casters ensure a consistent height off the ground is maintained when sweeping and also takes the weight off the front of the ATV allowing normal ATV manoeuvering and performance. 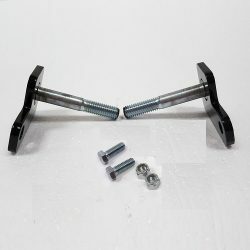 The sweeping height is adjustable from 1 to 4 inches, in half inch increments, to accommodate any conditions by adjusting the caster wheels up or down. Permanently charged Grade C8 magnet. 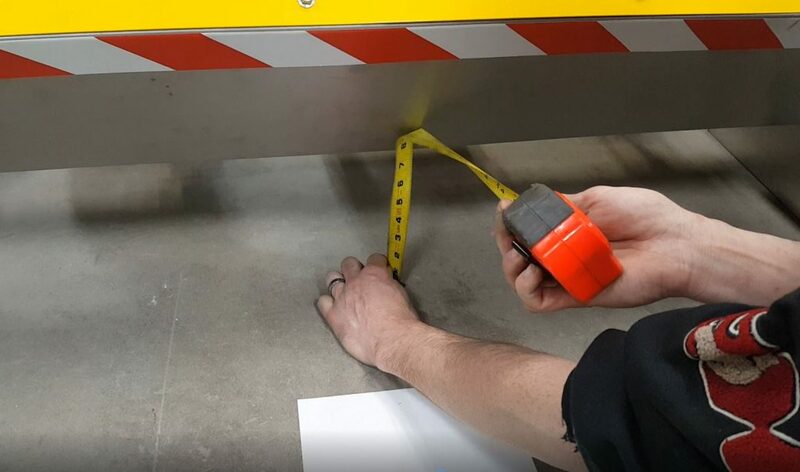 Sweeping Height Adjustment from 1 - 4 inches in 1/2 inch increments. Durable stainless steel and steel construction. Flat Proof 10” x 3” Tires. Easy debris release lever clean off system. The Longhorn comes almost fully assembled and is easy to install on any ATV in only a few minutes.